Luigi is sometimes referred to as "father jazz" since he is credited with creating the first formal jazz technique. There are numerous articles about Luigi and at least a couple of amateur films. qualified teachers it's not as popular today. The strength of the technique is that it imparts the most solid fundamentals from which you can do anything. 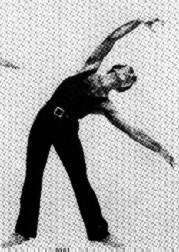 Luigi (Louis Facciuto) was a young professional dancer when he moved to California to further his career. A serious car accident left one side of him paralyzed and with very bad eyesight (double vision). Doctors said he wouldn't recover, but in typical 'hollywood hero' fashion, he was determined to dance again. When he was well enough, he went back to the studio and began doing work at the bar. He got to where he could do ok, but when he tried to dance again on the floor, his disabilities robbed him of balance and coordination. Then it struck him: "If I can't dance without the bar, I'll take it with me!" He was able to keep himself upright and poised by pushing down on an imaginary bar! Thus, "pushing down to go up", pushing down with your arms on the space around you, lifting up from the crown of your head is an underlying paradigm of the Luigi technique (and so much dance in general). When you releve', you aren't simply using your calves, you are lifting up from your head and pushing down on the space, pushing on the "bar". "Luigis Jazz warm-up" book, the exercise video "Luigi The Master Style Class" and newest music for class on CD, are available from Luigis Jazz Center and publisher Princeton Book Co/Dance Horizons. Dance historians have defined Luigis style as classic jazz, elegant, sophisticated, and even liquid fire. Writers have labeled him, An Ambassador of Jazz, A Pioneer, The Teachers Teacher, A Body Doctor and mostly, The Innovator. The exercise routine he created for his own rehabilitation after a paralyzing accident became the worlds first complete technique for learning jazz dance. He got the professional nickname "Luigi" from Gene Kelly.Born Eugene Louis Faccuito in Steubenville, Ohio, Luigi grew up singing and dancing professionally throughout Americas heartland. After serving in WWII, he moved to Hollywood to pick up his young career. Soon tragedy struck in a near fatal car accident. Doctors held little hope he would recover from a basal skull fracture, deep coma and paralysis down one side of his body. Yet within that coma, an inner voice told him repeatedly, "Never stop moving, if you stop youre dead." He eventually awoke to be told he would never walk again. His spirit said, "Im going to dance." 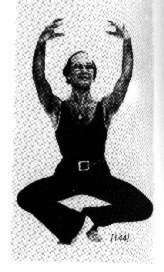 By himself, Luigi started creating stretching exercises that helped him discover what had to be done to control the body. He learned to "put the body in the right position." To "feel from the inside out." After a long year of trail and error, he regained enough strength and equilibrium to start dance classes again at Falcon Studios in Hollywood. Over a year later, Luigi, seen by a talent scout, was asked to audition for MGMs "On the Town," starring Gene Kelly and Frank Sinatra. He got the job and started an 8 year chorus career in over 40 films, such as: "An American in Paris," "Annie Get Your Gun," "Singin in the Rain," "The Band Wagon," and "White Christmas." Choreographers Gene Kelly and Robert Alton became his mentors. They and others put him to work with: Fred Astaire, Cyd Charisse, Doris Day, Judy Garland, Bing Crosby, Mickey Rooney, Donald OConnor, and Danny Kaye, among others. "Youve got a great style you should teach it,"
So Luigi started teaching a "jazz class" in 1951. He liked to teach while working in film, live theater, and in TV variety shows such as: "The Colgate Comedy Hour," and "The Red Skelton Show." He never stopped moving. In 1956, Luigi was brought to NYC to perform in the Broadway show "Happy Hunting" with Ethel Merman and Fernando Lamas. He danced and assisted choreographers on three more Broadway shows before dedicating himself to sharing his method. He opened "The First World Jazz Center." "A good teacher knows how to prevent injuries and can help anyone with injuries get better," Luigi says. He stresses the importance of using the body properly, telling students to "Take your time - feel what youre doing." His approach to the body is simple genius. Luigi says, "If you keep doing things right long enough, theyll get better right. But, if you keep doing things wrong long enough, theyll feel right -- wrong." The world has recognized Luigis artistry by inviting him to give master classes throughout North and South America, England, France, Hungary, Italy, South Africa and Japan. He has served on the faculty for the Harkness Ballet School, High School for the Performing Arts, Sarah Lawrence College, NYU, Metropolitan Opera House and Joffrey Ballet School. Luigis talents and perseverance have given him the opportunity to work in every part of show business, from burlesque to Hollywood musicals, Broadway and beyond. His method is taught today by not only himself, but by his students in schools and colleges all over the world. 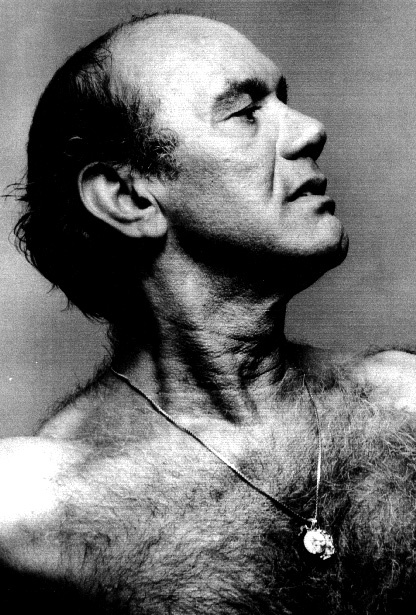 FRANCIS J. ROACH has danced in TV and Broadway specials, choreographed MTV videos, Off-Broadway, national commercials, industrials, and fashion shows. Hes appeared with Liza Minnelli, Shirley MacLaine, Gene Kelly, the Pointer Sisters & choreographed a magazine layout for Charlotte DAmboise. Roach travels the world teaching the Luigi Jazz Technique. In addition, he teaches at the Joffrey Ballet School, the West Side "Y," and has been faculty for the International Ballet Competition in Jackson, MS. Not only has he starred in his own concert tour in Japan, but has been invited back over 10 times to teach and choreograph. Roach co-authored with Luigi and Lorraine Person Kriegel the book, "Luigis Jazz warm-up. Liza Minnelli "I found Luigi to be an invaluable teacher and his technique has stayed with me." Robert Morse "Luigi is stylish, graceful, aristocratic, permanent, visionary and so very kind to us all who are beginners daily." Twyla Tharp "Ive never had more fun than dancing in Luigis classes." John Travolta "Luigi always defined jazz dancing for me." Lorna Luft "Luigi is the father of modern jazz and a wonderful teacher. His technique is fluid and beautiful and a joy to dance." Bob Fosse "A Luigi trained dancer is always dedicated and well trained." 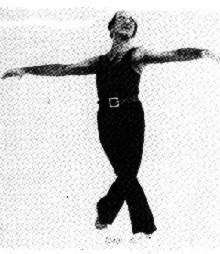 Jacques DAmboise "A love and knowledge of the discipline of classical ballet permeates Luigis jazz style and elegance." "Loni Ackerman - Alvin Ailey - Michael Bennett - Sheila Bond Richard Chamberlin - Yvonne Constant - Joseph Duell - Sandy Duncan Wendy Edmead - Tania Elg - Ron Field - Peggy Fleming - Elliott Gould - Renato Greco - Joel Grey - Hama Valerie - Harper Judy - Kaye Gemsee de Lappe - Johnny Mathis - Patricia McBride - Bette Midler - Donna McKechnie - Molly Molloy - Michelle Pawk - Ann Reinking - Tony Roberts - Barbra Streisand - Susan Stroman - Christopher Walken - Chet Walker - Leslie Ann Warren - Eva Von Gencsy ....... and many many many more !! Do you have any more material about Luigi?